Gay Timmons, M.S. - Founder - Oh, Oh Organics Inc. 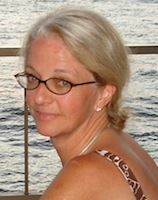 Gay owns and operates an organic and specialty ingredient distribution company which she founded in 2001 for the delivery of sustainable agricultural ingredients to the cosmetic and personal care industry. As a major industry consultant and advocate for regulatory protection for organic producers and consumers, Gay has actively participated in the organic and natural industry for 25 years. She holds a degree from U.C. Davis, and has an M.S. in Physiology, and her introduction to the field began as a 10-year co-manager of an organic farm and production facility. Gay has served as Chair of the California Organic Products Advisory Committee, and was also Secretary on the CCOF Board of Directors and Chair of the Processor Chapter for 11 years. She lives with her two, college age organic daughters in Point Richmond, CA, and her philosophy is “If it is not a sustainable act, it is not worth doing.” Food, relationships, business, consumer goods---all need to shift to a paradigm that measures them by their sustainability. 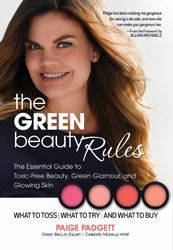 Paige Padgett, celebrity makeup artist and author of The Green Beauty Rules (HCI Books), is the Founder of paigepadgett.com and is considered a leading authority on ‘green beauty’. She is often sought out by the press and has been featured in Shape, GenLux and Natural Solutions and is often quoted in Elle, Self, Women’s Health, Ladies Home Journal, Good Housekeeping, The Los Angeles Times, Vegetarian Times, Natural Health and Whole Life Times Magazine. Her television, radio, and podcasts include “Martha Stewart Radio,” “Good Day Oregon TV Show,” “San Diego Live Morning TV,” “The Jillian Michaels Radio Show,” “Green Is Good Radio Show,” “The Healthy Voyager Radio”, “Growing Boulder Radio Show,” “Big Blend Radio” “RadioMD” and “Leeza Gibbons Hollywood Confidential Radio Show.” Her engaging talks and workshops have been shared at “Women For a Healthy Environment” and “The Jillian Michaels Wellness Cruise.” Paige has also been a contributing writer for Les Nouvelles Esthetiques & Spa, Natural Solutions, Happi and Mind Body Green. As a tastemaker and purveyor of beauty she has been a curator for OpenSky and Goodebox, a green beauty expert for Dasani ECOmunnity and spokesperson for Softcup. In addition to speaking, writing and consulting, Paige is constantly in demand for her makeup artistry. Paige has worked on celebrities such as Jillian Michaels, Chloe Sevigny, Julia Ormond and Keanu Reeves; and the runways of Diane von Furstenberg, Badgley Mischka and Agent Provocateur. She lives in LA and is a single mom to a 2-yearold daughter. The Detox Market is the outcome of two events: A demand for answers in a complicated world of greenwashing, and a retail solution by two passionate eco-preneurs, Valérie Grandury and Romain Gaillard. As a breast cancer survivor bent on completely detoxifying her life to heal, Valérie’s mission was to find solutions not just for herself, but for her family and friends, so she created Odacité, her eco-conscious skincare line. She soon learned her clientele sought advice on much more than organic skin care. They wanted to know where to find natural, non-toxic, quality lipsticks, hair sprays, nail polishes, candles, skin care...anything she could recommend. They wanted products that were both pure and effective and were seeking a source they could really rely on. The Detox Market was that solution. Romain and Valerie scouted the world looking for products that removed offending chemicals and pollutants without losing efficacy; they carefully screened and tested hundreds to find the best of the best. Their choices were confusing, and at times deceiving. Then, voila, it dawned on them: Why don’t we offer these amazing brands under one roof? So they created a toxic-free space combining the Green of California with the flair of Parisian Chic and in November, 2010, opened their first organic shop on Abbot Kinney in Venice, CA. It was an instant success. Working exclusively with smaller companies serious about organic living, they were soon awarded “Best Concept Store” by Women’s Wear Daily. After a few months they opened new pop-ups in West Hollywood, Los Angeles and San Francisco. Then a Canadian Naturopathic Doctor dropped by to see what the buzz what about and convinced them to open in Toronto, so The Detox Market debuted on King St. West. They continue to do business in W. Hollywood and Toronto and online at www.thedetoxmarket.com. “We never intended to start a new venture. The Detox Market is a passion project, an experiment that turned out well,” says Romain Gaillard, Co-Founder of The Detox Market. Romain shares insights about retail success and formulas for seeking out successful Organic and Natural products.